Another Thursday, another election debate. But who needs Brown, Cameron and Clegg when you have five of the eight parliamentary candidates for Hampstead & Kilburn to listen to. The London Jewish Cultural Centre played host to this Ham & High hustings and the room soon filled up. 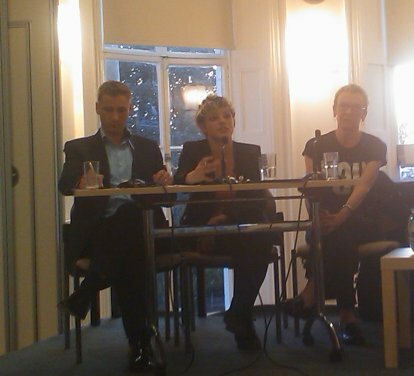 To capture the mood of hustings, read Sarah’s excellent report on Tuesday’s West Hampstead library hustings. Here I attempt to assess each candidate’s performance on the various questions, see whether there was an overall winner, and then look briefly at where we stand in this three-way marginal. It’s a long blog, if you want to skip to the verdict or to the specific topics (‘Clegg effect‘, Europe, the role of MPs, education, Brent Cross and Israel), then please do. My views here are of course subjective, but are based on how I felt candidates performed and were received in the room, rather than on my views on their policies. From left to right we had Conservative Chris Philp is his obligatory open-necked shirt, independent candidate Tamsin Omond with her shock of blond hair, Beatrix Campbell from the Green Party but wearing all black, incumbent Hampstead & Highgate MP Glenda Jackson wearing Labour Party red, and suited Ed Fordham, the only candidate sporting an old-school rosette, yellow in his case for the Liberal Democrats. Each candidate was given a couple of minutes to introduce themselves. Ed spoke in broad terms about the “sense of something else” in the air, and made the point strongly that our votes counted while mentioning electoral reform. Glenda went big picture too, saying that nothing less than the future of our country was at stake, and the decision was between moving forward or stasis. She plied the Labour line that the economy was the key issue while we are in this period of fragile recovery and dismissed any notion of voter apathy – even before last week’s opening TV debate. Bea gave us her potted biography, citing her working-class roots and how the state education system, NHS and housing program had been at the heart of her life. She lost her thread in the middle and had the air of an undergrad tutor leading a seminar. She sounded much more old Labour than Green. Tamsin’s opening was the most polished of the candidates, if sounding a little rehearsed and speech-like rather than conversational. She confessed that after some experiences during this, her first campaign, she didn’t like being a politician before using her time to say that not voting wasn’t the worst thing that could happen, the worst thing was for politicians to fail to engage with constituents who then felt that the BNP was their only option. Chris was last to go and opened with a cheap gag about Nick Clegg that was met with louder groans than laughs. He reinforced his local credentials both as resident and campaigner before being the only candidate to really mention party policy at this stage and to criticise Labour’s overspending during the boom years. Winner: this was Tamsin’s round, despite drifting perilously close to a rally speech, she was the most eloquent and came across as the most passionate. The first question from the chair was about the sustainability of the Nick Clegg effect. Ed disarmingly said that it was so extreme that it didn’t feel real and argued that there was the election the electorate was thinking about and the election that the media was reporting on and they were not the same. Glenda said the impact was largely due Clegg’s previous anonymity and that we were “supposed to be an adult nation” who wouldn’t be affected by a media story. Bea thought the Clegg effect wouldn’t be forgotten whatever the election outcome, referring to a “potent sense of collective self-discovery.” Whatever that meant. Tamsin got the first proper laugh of the evening by saying she was surprised at the post-debate reaction because she “didn’t think Clegg had been very good”, going on to praise Gordon Brown’s performance. Chris didn’t really answer the question, instead saying that the election was a choice between “more interference” or a “new approach”. He also pointed out that all the candidates were sporting a “campaign tan” from being out on the sunny streets so much! At the previous Ham & High hustings, Tamsin had been in the audience and UKIP’s Magnus Nielsen had been on stage. The situation was reversed here, and Nielsen got to ask the first question, which was about Europe’s plan to carve us up into regions. Glenda was very dismissive, citing the very raison d’être for the European project – namely to bind France and Germany in a peaceful relationship. Chris set out his pro free-trade stance although didn’t believe in forcing states to do things “against their will”, making a bizarre comparison to the former Yugoslavia. He of course argued in favour of a referendum on treaties but is in favour of EU membership. Tamsin’s short answer was that “We’re in it so we should make the best of it”, while cautioning over relinquishing too much sovereignty. Bea gave us a history lesson, which concluded that the UK was better off as part of Europe. Ed talked about holding referenda on some big issues but not to unpick all that had gone before, and distinguished between the idea of “difference and division”. Magnus then plugged his blog [link from UKIP site doesn’t work], and – having been prompted by Glenda to the amusement of all – his book [which I can’t find on Amazon, although he said it was available there]. The first question from the floor was about MPs’ availability, the questioner suggesting that the constituency hadn’t had an accessible MP for 30 years. Glenda, MP for 18 of those 30 years, was given first bite of the cherry. She said she was “shocked and stunned” at that assessment, and said she was available 24 hours a day, 365 days a year. She argued that “the work of a MP is what constituents demand of me”. She became a bit irate and said she was hurt by the question. Ed talked about his local achievements as a campaigner, and how MPs had influence if not power. Bea, who lives just over the border of the constituency, said she’d “like to answer the question in a slightly different way”, eliciting a heckle of “again?”. She had a dig at Tamsin’s desire to represent everyone and said that constituents didn’t need “looking after”. She also pointed out her activist background. Tamsin sought to clarify her position. “I will be your representative”, she explained before saying that she would be “the most energetic conversation starter you have ever known.” At this point Tamsin seemed ever so slightly like Bea Campbell’s mini-me. Chris felt it necessary to mention his local wedding again, before telling us his nickname used to be Tigger. The question of who exactly had saved Hampstead police station came up, with Chris saying that Ed’s intervention had been irrelevant, whereas he himself had spoken to the decision makers. Glenda chimed in that the police stations had “never been under serious threat”, to looks of disbelief from Ed and Chris and boos from the audience. A woman in the audience then put it to Glenda that if she lived in the consituency (she lives in Lewisham) she would have fought harder on issues such as the closure of the South End Green sub-post office. Glenda put up a very robust defence both on that particular post office issue depsite cries of “Shame” from the audience, and on her place of residency. She argued that MPs outside London spend five days a week at Westminster so are hardly full-time residents of their constituency. The questioner felt very strongly that in today’s political world, MPs must be local. Glenda countered, citing the number of letters she receives about national and international issues. The next topic was education, specifically the lack of primary school places in Camden. Chris got another family values point in as he said he hoped to be experiencing these issues for himself soon, before reiterating that he was in favour of state education. He then brought up the Tory’s education policy of getting local groups to run schools. Tamsin kicked off with the dry remark that mothers had so much free time on their hands that running schools would be easy, to applause from the audience. She then talked about community-based education, which didn’t actually sound that different from some of Chris’s ideas, and raised the idea of retired teachers coming back to help in schools. Bea rather neatly used Chris’s own words of “empowerment” and “liberating” to mock the Conservative proposals before setting out a vision for education that removed inequality of standards and meant that the local school was the best school. Glenda tried to tackle the issue about Camden schools but focused on secondary education to begin with. Ed, who was shaking his head while Glenda spoke, then showed a very confident grasp of all the facts and figures of local schools and funding. 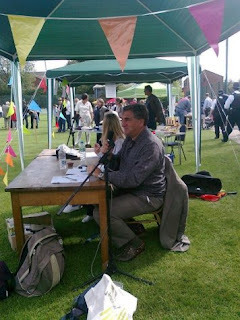 He argued that it was time for a big conversation about education in north-west London. His understanding of the topic, and the challenges of balancing state and private education demand, especially in Hampstead, impressed the audience who gave the first proper applause of the evening. Ed, also managed to get in the word “assiduously”, to match Bea and Glenda who had used it earlier! Another local question: should the new Brent Cross development go to a public enquiry, given the impact it would have on local high streets? Bea: Yes, yes, yes. Tamsin: Yes. She then mentioned the West Hampstead loyalty card scheme that has been mooted for a while, suggesting it could be a cross-consituency card, so Kilburn shoppers could get benefits in Hampstead and vice-versa. Was hard to tell whether a horrified shudder spread across the room. Chris thought that part of the proposal – namely the incinerator and tower – should go to an enquiry, but otherwise trusted Barnet council. He then got on to one of his favourite topics – business rates and taxation of small businesses. He referred to the closure of the Kilburn Bookshop, and became quite animated. The oratory worked and he got a big cheer for his anti-tax anti-regulation position. Glenda said yes to the inquiry and then tried to fight back against Chris but was a little weak and Chris moved in for the kill saying small businesses had been “taxed to within an inch of their lives”. More cheers. Glenda was on the back foot, but Chris perhaps overplayed his hand with a weaker attack on Labour’s tax record, although the crowd still responded well. Ed looked Chris in the eye and recalled the day under a Thatcher government when his father’s business was repossessed. The audience was in no mood for maudlin tales and heckles of “answer the question” and “a lot’s changed since then” rang forth. He argued that citing the Kilburn Bookshop is disingenuous as he knows the owner and business rate were not the main reason for closure. He then finally got round to the question and it turns out was involved in drafting the LibDem’s original objection. He went on to criticise both the Tory’s and Labour’s planning laws to a round of applause. The final question of the evening was the one that had been talked about in the café beforehand. A woman asked an extremely well-phrased but direct question to Ed about the Liberal Democrat policy on Israel citing the mixed messages from the party. She mentioned Baroness Tonge, whose anti-Israeli comments eventually led Nick Clegg to sack her, but her continued presence in the House of Lords has angered many. The questioner also mentioned the disparity in message between LibDem leaflets in Holborn & St Pancras that clearly target the area’s Muslim community, and those delivered in Hampstead with some text in Hebrew and photos of Ed with members of the Knesset. The question drew applause. There was no doubt this was the tough question of the night, and obviously one of particular interest for many of the audience given that this was being held in the Jewish Cultural Centre. Ed began by stating the Lib Dem’s official policy, which he mentioned is broadly the same for all three main parties, namely a peaceful negotiated two-state solution. He then criticised Baroness Tonge very clearly. “Lose the whip”, someone called out. Ed explained that as a member of the House of Lords the whip couldn’t be removed, and Clegg had done all he could by sacking her. The audience wasn’t overly impressed. Ed continued saying that the LibDems had got themselves in a “difficult place with Israel”, perhaps partly as a result of their strong opposition to the Iraq war. Ed explained why he had embarked on “political tourism” to Israel and Gaza, and met with members of the Knesset from all parties. The thrust of his point was that he personally recognised the importance of understanding the issue from all sides, and would do all he could to get the party on track. Although he mentioned that the constituency had almost equal numbers of Jews and Muslims, he didn’t address directly the issue of the mixed messages between this constituency and Holborn & St Pancras. He did however get some applause for his answer, and there was a feeling that at the very least these were issues he took seriously and had thought about. Glenda reiterated Labour’s policy of a negotiated solution, although thought it looked unlikely before embarking on an articulate, passionate and emotional speech about the horror of the conflict that clearly came from the heart. Bea possibly sensed trouble and chose to quote directly from the Green’s manifesto, which criticises Israel’s “campaign of collective punishment” against Gaza. She didn’t get very far before an angry voice shouted back “what about the Hamas rockets?”. After a moment of back and forth, Campbell declared that the man wasn’t prepared to listen so she should shut up. He agreed. Tamsin backed away from the issue and talked about local grassroots organizations “working things out”, citing a couple of groups in the Middle East that are trying to do that. Chris, a “Conservative Friend of Israel” focused on the Lib Dems, pointing out that Clegg has said that Israel should be disarmed, that Jenny Tonge was made a peer after she had said some of the contentious things about Israel, and disagreeing that she couldn’t be removed from the Lords. He said the Lib Dems should be ashamed of trying to stir up community feeling. He then rather undermined that point saying that it seemed the Lib Dems “had a list of Jewish people. I can’t be alone in finding that a bit creepy”. There was a murmur in the crowd, and Chris was certainly alone on the stage as all the other candidates and the chair turned on him for that emotive comment. Ed responded, focusing again on his own perspective and getting a warm round of applause. The original questioner said she would hold him to his word. Overall verdict: Ed and Chris both performed well. Glenda had her moments, but her inability to remember details was shown up next to Ed’s grasp of minutiae. Bea, although likeable, seemed too keen to have an intellectual debate (and heaven forbid there should be intellectuals in politics!). Tamsin, having got off to a great start, was always going to struggle on some of the specifics, and her mantra of starting conversations and solving everything locally perhaps wore a little thin towards the end. Ultimately, Ed shaved it over Chris whose only really strong performance came on the small business issue. So, where do we stand in Hampstead & Kilburn with less than two weeks to go? Weighing up the balance between local issues, individual candidates and the national situation is extraordinarily difficult in this constituency. Lets deal with the minor players first. Despite Tamsin’s fears that the BNP might gain traction with some voters, they don’t generally poll well here. UKIP might fare better if their candidate didn’t seem (as one of his rivals put it privately) “like a Shakesperean fool”. The unknown Gene Alcantara will do well to break the 100 vote barrier. Intuitively, one feels the Greens should perform well here but, other than at hustings, Bea has been quiet locally and the party lacks the resources to do damage. She is also contesting a council seat and may have better luck there. Tamsin, fourth favourite with the bookmakers, is the unknown package. She’s been working hard to get people registered to vote, and anecdotally is receiving support, but her target group of voters may still not turn out on election day, whatever promises they give on the street. A sunny day and an enormous final push could see her getting a meaningful number of votes, and a fourth place finish ahead of the Green party would be impressive. So, what about the big three? It may be too easy to write Glenda off, Labour still has a strong base of support and hasn’t been as badly hurt as some might have expected. A rally for Labour nationally could still see her in with a shout on May 6, although the sense that she personally may have served her time is hard to escape. This presents a problem for the ABC (Anyone but Conservatives) crowd, as tactical voting is hard to judge. Mercifully, none of the main three candidates trotted out the “it’s a two horse race” line this time – lets hope that’s dead and buried now. Chris will appeal to the diehard Tory voters, and will pick up floaters who like his get-up-and-go attitude. But as the Cameron campaign struggles to deliver the killer blows to a surprisingly resilient Gordon Brown, will Chris be able to count on enough of a general swing to the right to take the seat? His will be the last name called by the returning officer when the result is announced, and only then will the winner be known. Ed is the bookie’s favourite just ahead of Chris, and has performed well in hustings. The Lib Dems are always strong on the ground with several forest-worths of material shoved through letterboxes every day. His “lives here and loves it” campaign makes him seem accessible and for those tired of Glenda but not ready to turn blue, he may turn out to be the obvious choice as it is hard to dislike him or doubt that he would work hard. Whatever you do, get out there and vote.